Looking for a dinner idea that’s light on ingredients but big on taste? Keep your grocery list short and sweet with this simple low FODMAP penne alla vodka. Packed with fresh flavour and a rich, creamy texture, this classic pasta dish will be a family favourite in no time! Have you ever heard the phrase “less is more?” I’m pretty sure they were talking about this penne alla vodka. Considering it’s basically crushed tomatoes and basil on pasta, this recipe packs a serious flavour punch! Since this recipe is so light on ingredients, it’s also a budget-friendly option when you’re feeding a crowd. Since you don’t need to worry about overcrowding your pan, you can double or even triple the recipe without adding a ton of extra time. 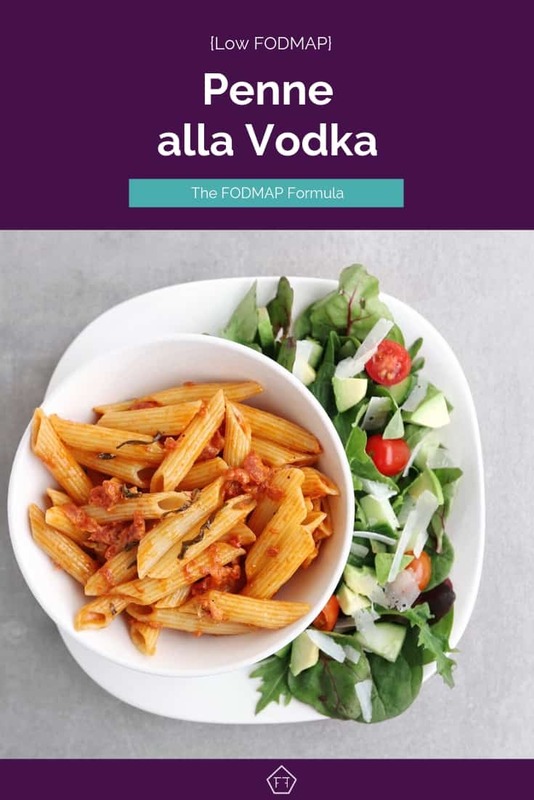 Think this low FODMAP penne alla vodka sounds great, but you don’t have time to try it now? Don’t worry! You can PIN THIS POST for later. Looking for a simple dinner idea? This low FODMAP penne alla vodka will keep your taste buds and your tummy happy! Check out the notes below for tips on keeping this recipe FODMAP friendly. First up, garlic-infused oil. Since FODMAPs don’t break down in fats, we can safely infuse their flavour into products like oil and butter. When you’re purchasing a low FODMAP garlic-infused oil, remember to check the label for ingredients like “garlic extract,” or “natural flavours” as these are high FODMAP. You should also check the bottle for any visible pieces of garlic or sediment. If you’re nervous about trying an infused-oil or if your local grocery store doesn’t have any low FODMAP brands, grab this Monash certified garlic-infused oil from Fody Foods Co.
We’ll also be using whole, peeled tomatoes. According to the Monash app, canned tomatoes are low FODMAP in servings of 3/5 of a cup (92 g) per sitting. Servings of 3/4 cup (115 g) or more are high in the FODMAP fructose. Our recipe uses 1 cup of tomatoes for four servings. This works out to 56.25 g per person, which is well within Monash’s recommended range. This recipe also uses vodka! 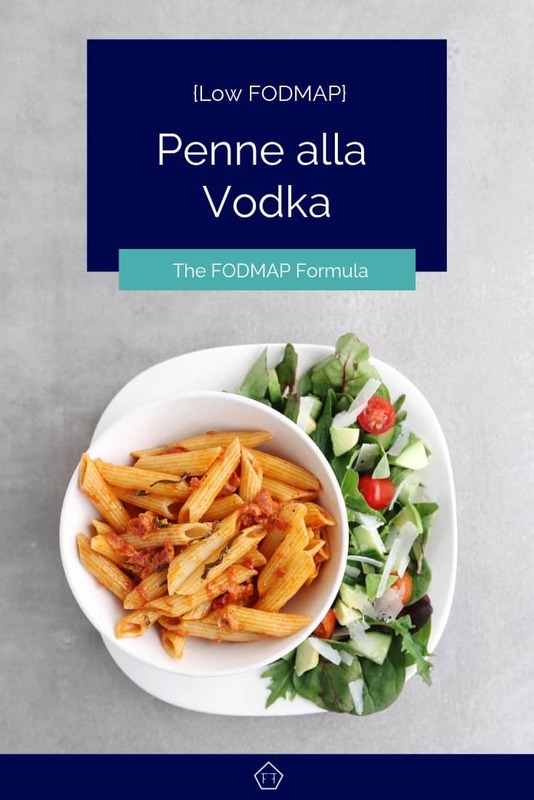 According to Monash, vodka is low FODMAP in servings of 2 tbsp (30 ml) per sitting. Though, Monash doesn’t list a maximum serving. Our recipe uses 2 tbsp of vodka total, which is well within the recommended range. If you’re sensitive to alcohol, don’t panic! The alcohol will burn off within a few seconds of hitting the pan, leaving the flavour behind. 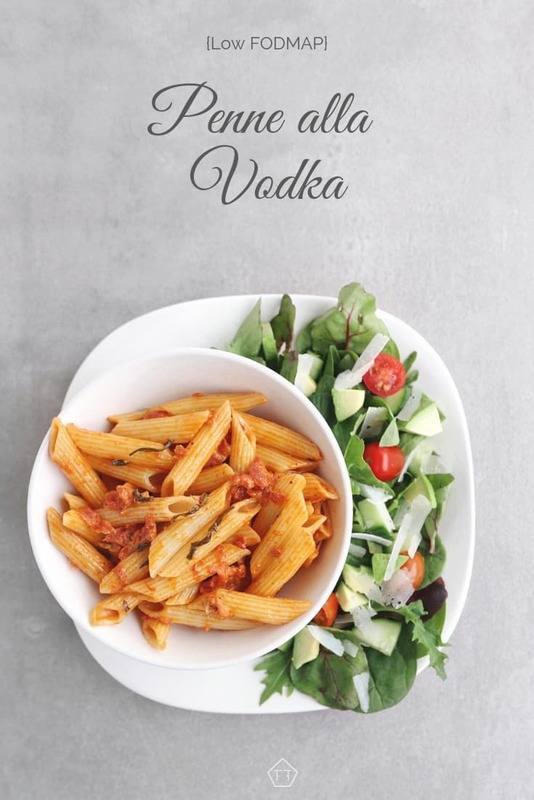 If you don’t have any vodka handy, or if vodka isn’t your thing, you can swap it out for two tbsp of your pasta water. We’ll also be using heavy cream. If you’re in the elimination phase of the program, you’ll need to use a lactose-free product. For my Canadian peeps, both Natrel and Lactantia have lactose-free lines that go up to 35%. Last but not least, pasta! 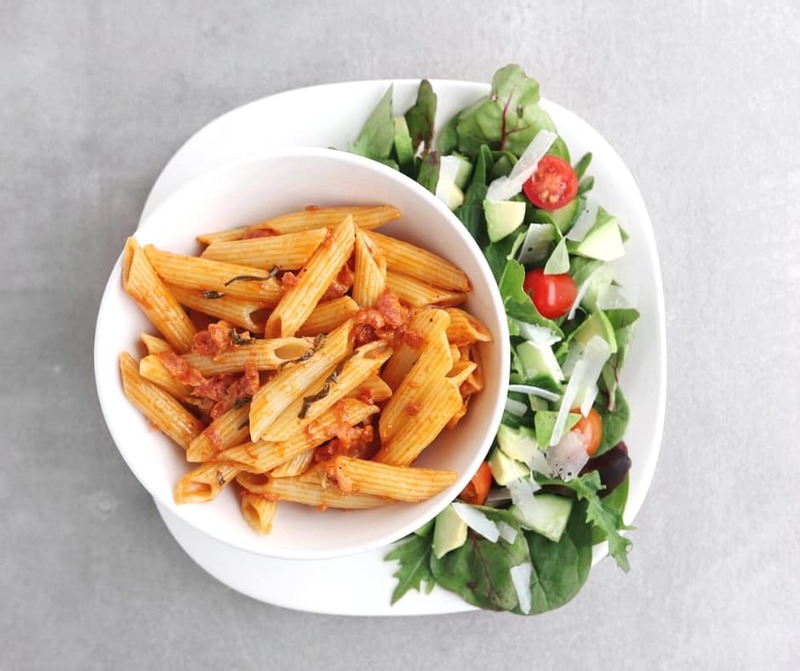 According to the Monash app, gluten-free pasta is low FODMAP in servings of 1 cup per sitting. Servings of 1.5 cups or more are high in the FODMAP fructan. Our recipe uses 4 cups of pasta total, which works out to 1 cup of pasta per person. This is within Monash’s recommended range. 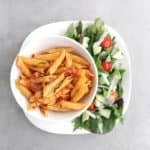 Want to try this low FODMAP penne alla vodka? Don’t forget to PIN THIS POST for later! This pasta tastes fantastic with a nice fresh salad as a sidekick! Try pairing it with my easy garden salad, greek salad, or my pomegranate salad. Looking for a simple dinner idea? Try this classic low FODMAP penne alla vodka! Heat oil in a large frying pan over medium heat. Add whole tomatoes and cook for 2-3 minutes, breaking them up with a wooden spoon as they soften. Stir in fresh basil, salt, and pepper and simmer (covered) for 15 minutes, stirring occasionally. Add vodka to the sauce and simmer for another 15 minutes, stirring occasionally. Stir in cream and simmer for an additional 10 minutes. Then toss with cooked pasta. Serve immediately. Your whole family will love this simple low FODMAP penne alla vodka! Did you like this recipe? Don’t forget to share it. Together we’ll get the Low FODMAP Diet down to a science! Low FODMAP Pasta with Roasted Red Pepper Sauce Made with roasted peppers and cherry tomatoes, this easy pasta with roasted red pepper sauce has a deep, savoury flavour that will have even the pickiest eaters coming back for seconds. Low FODMAP Chicken Parmesan Ready to put a FODMAP-friendly twist on a classic dinner recipe? Covered in low FODMAP breadcrumbs and baked in a savoury marinara sauce, you’ll forget this chicken parmesan is low FODMAP!